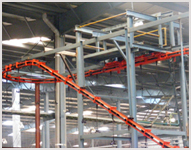 We design and supply Industrial Conveyors and process flow to increase productivity and flow in your plant. 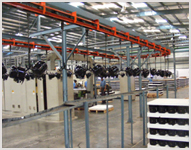 Conveyor systems are a very important operation in feeding the assembly line and also increasing productivity. 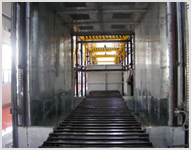 These Industrial Conveyors are the best possible answer for varied industries for the easy lifting and transporting of material from one spot to the other. 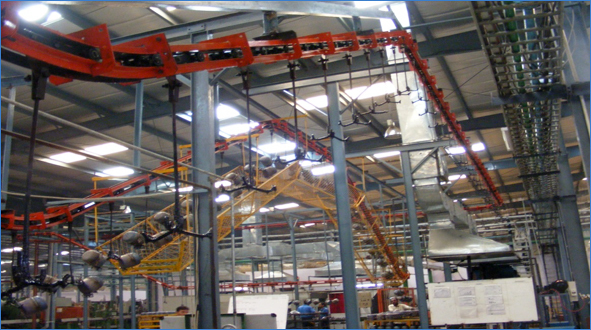 Our range of conveyors includes chain, belt, roller, screw, pallet, friction, bottling, flexible, and special purpose conveyor systems. 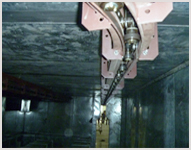 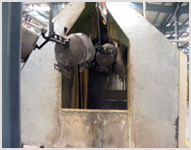 The systems include both linear, rotary and screw motion systems. 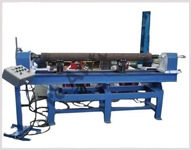 They can withstand temperatures between 800 deg c to -42 deg c.
We have come up with highly efficient Conveyor Roller Welding Automation Solutions that is made in accordance to industry standards using best raw material. 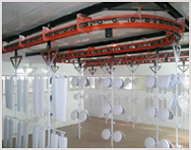 These systems are known for accommodating the different diameter and Length of Rollers in an easier way. 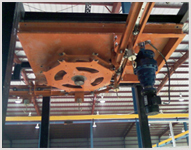 Equipped with Pneumatic operated clamping systems and PLC based control Panel, these are totally easy to operate and thus provide higher production.